Dental implant treatment has seen a fast development in recent years and an important factor is better access to detailed information based on digital planning tools, sometimes in conjunction with surgical guides. Properly used this development can result in a more predictable outcome and more difficult indications can be treated, hence making dental implant more accessible to patients who could not readily be treated before. Neoss’ approach to the vast numbers of different planning software and surgical guide manufacturers available today is to use an open platform approach meaning Neoss aims to have the complete Neoss offering incorporated in all important planning software, often utilizing existing investments a practice has made. 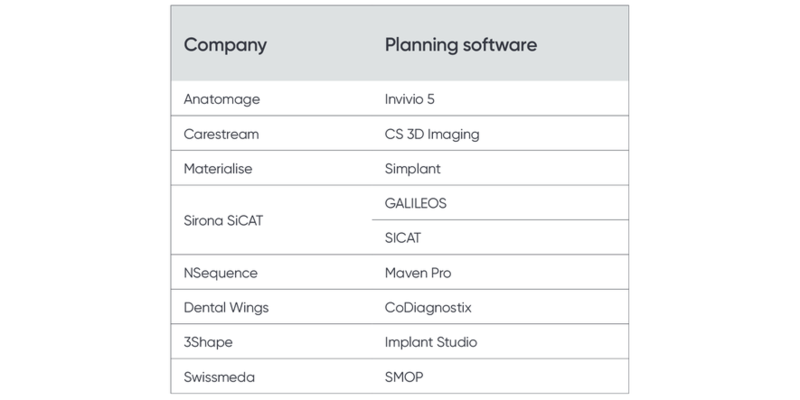 The Neoss® Implant System is incorporated into a significant number of the most common planning software available on the market today. Neoss® Guide Kit provides a fully guided solution for surgical preparation using the same Neoss cutting tools as for normal implant placement and by using your planning software and guide manufacturer of choice. This results in an efficient and cost effective method for dental implant placement with minimal new investment. For further information on related topics please refer to the section for Neoss Surgical Guide Solutions and Individual Prosthetic Design.